We have new photos and rooms to reveal from our Villa Blanca project! Last year we introduced you to this home as we toured the dramatic transformation of the kitchen, den, breakfast room, and butler’s pantry. 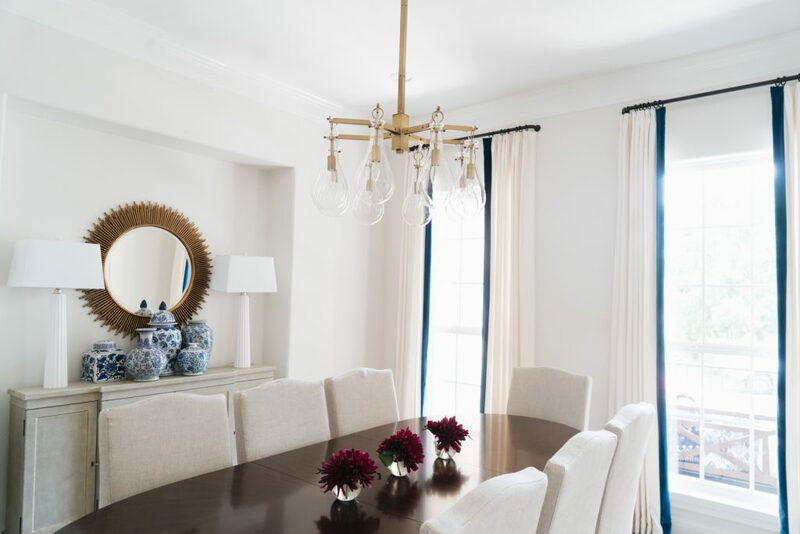 Our clients brought our team in to help transform their traditional Texas home into a timeless space that felt fresh and youthful. If you need to play catch up, here is a tour of those spaces. As promised, we have more of the downstairs to share with you including the study, living room, and master bedroom! We will start with the dining room as we continue to tour more of this youthful house. 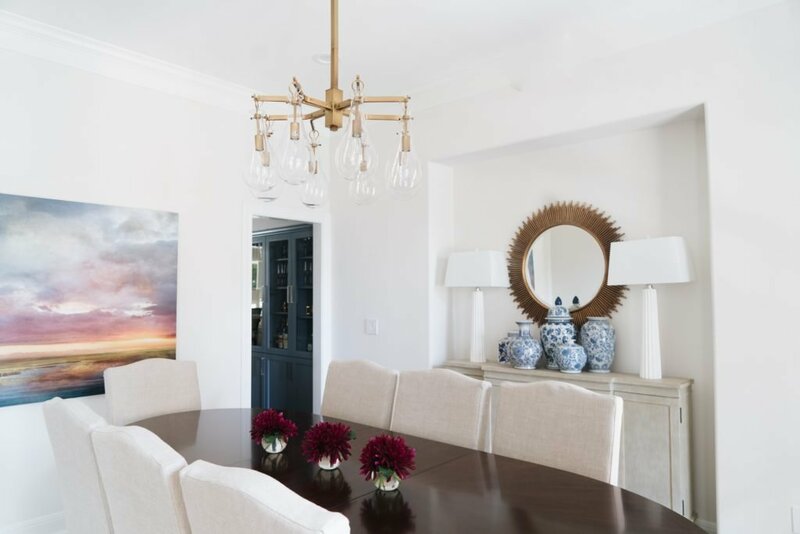 To keep the space feeling bright and airy, we opted for skirted dining chairs and a dark oval dining table with a subtle inlay. These are classic pieces that can transition with our clients as their tastes evolve and change. A gray washed sideboard with subtle gold detailing adds a casual sophistication to the space. 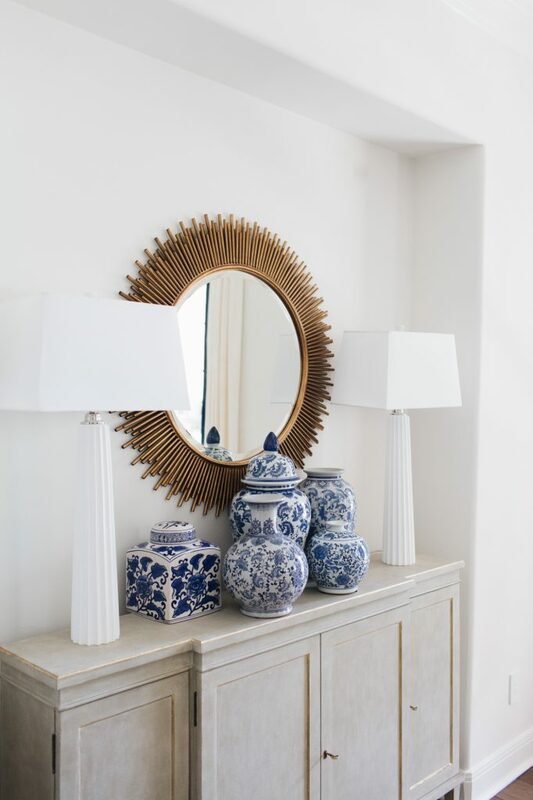 We paired it with a fun starburst mirror, white fluted lamps, and a mix of timeless blue chinoiserie vases. The blue vases tie in the color scheme of the home, which is also accented by the blue trim on the white linen draperies. The brass chandelier is a trendy, funky, and a little unexpected. It is a fun addition to the dining room. Next week we will tour the moody study that sits right across from this dining room. Be sure to stay tuned!